Do you love fried food but hate the effect it has on your waistline and cholesterol levels? 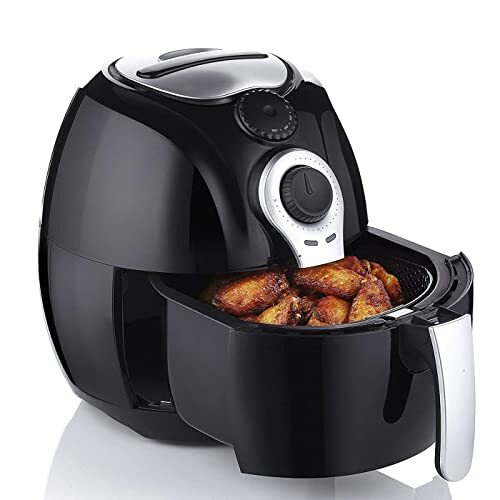 How about treating yourself to an air fryer to get the taste sensation without all the oil required for deep frying? Today, we’ll break down 7 of the strongest options and perfect for a family of 4. We’ll give you a quick teaser of our overall favorites before clarifying what size air fryer you need then it’s on to the main event. If you’re looking for an air fryer to feed a family of 4 without eating up too much counter top real estate, the Avance Turbostar is the obvious choice. Use the dial and screen to navigate and customize settings. 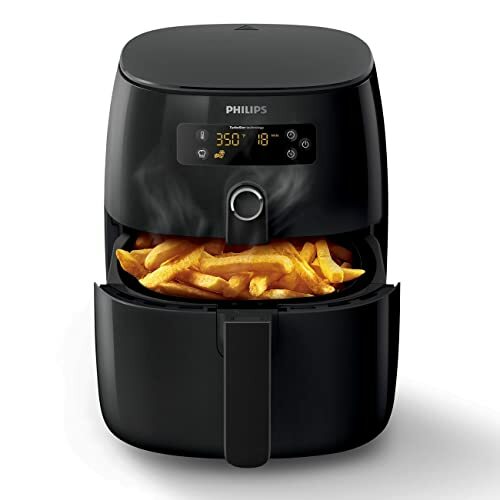 Then sit back and let the Philips help you feed your family healthier food without losing out on that browned effect. I. 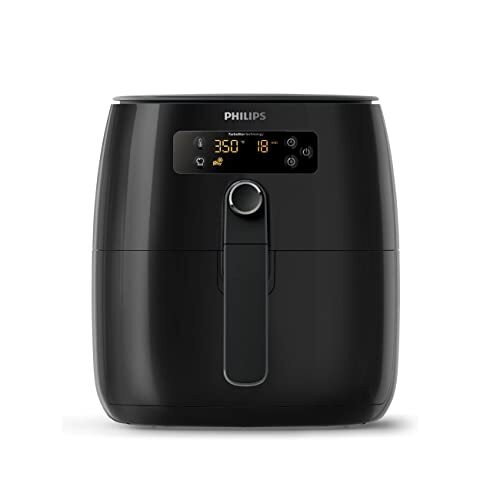 What Size Air Fryer for a Family of 4, 5 or 6? One of the most common questions we’re asked about air fryers is what size you need for varying numbers of people. Luckily, this is super-simple to clear up with some simple guidelines. 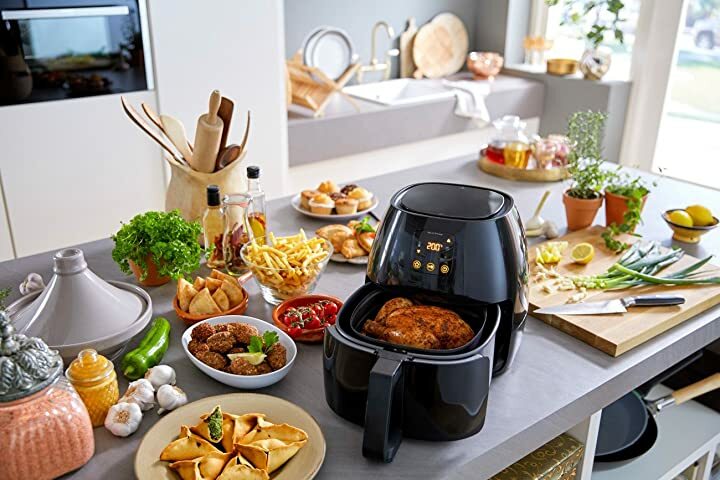 A 2.7 ~ 3.5 quart air fryer is ideal for anywhere from 1 to 4 people. If you’re looking to cook for 5 or 6, aim for a 4.0 ~ 5.3 quart air fryer. Both these sizings come with advantages and drawbacks. The key here is carefully analyzing your own circumstances so you don’t get sold short and you don’t buy a larger unit than you need either. By catering for up to 4 people with a 2.7~3.5-quart unit, you’ll get an appliance with a far smaller footprint. If you live in a smaller apartment or you have limited storage space, this can be an essential component of your buying decision. How about if you have guests over, though? What about if your family grows with a new baby suddenly and unexpectedly coming into being? What if you like the idea of cooking up some food for later or the following day? If you want to cover all bases or you simply have larger family to cater for, it pays to go large and get a 5.3-quart fryer. This assumes, of course, that you have the space to accommodate it on the countertop and the storage space to stash it when not in use. We would never suggest that you buy a more expensive or larger product for the pure sake of it. What we would advise is to make sure that a capacity enough to feed 4 will be adequate for all circumstances. Sometimes, it’s best to spend a little more if you’ll save money in the long run. After all, what could be worse than buying a smaller unit you fall in love with only to realize it’s not quite big enough for your needs? In effect, the Avance is a mini convection oven and it’s the perfect size to feed a family of 4 without needing to rely on deep frying. With the rapid air technology, you’ll get that hot air whipped around quickly and accurately so you can enjoy the advantages of crisped, browned food without an excess of fat. Touch screen operation is highly responsive and intuitive even if you’re not a great tech-fan. There’s a 60-minute timer and you’ll be able to ratchet the temperature up to 390 degrees Fahrenheit. The air fryer is as easy to clean as it is to use with dishwasher-safe components meaning you won’t need too much elbow grease. You can also grill, bake or roast with this mini oven so you’ve got all bases covered in a powerful, flexible unit. Another Philips Avance up next, this time the Turbostar. Again, this air fryer is tailor made for a couple with two children. At 2 ¾ quarts, it’s a little smaller than the XL while still accommodating enough food to keep your husband and kids happy. With a single click you can flick between air frying, grilling, roasting or baking for a multi-purpose appliance with a fairly compact footprint. You won’t need to preheat the Turbostar so you can get going the moment you set foot inside the kitchen. As with all Avance models, you can slip out the non-stick rack and drawer and pop them safely in the dishwasher. T-Fal serves up a cost-effective air fryer that’s built to last and perfect for a family of 4. Intelligent design keeps the smell safely contained while the handles are stay-cool and the lid tightly sealed to prevent any splashback against your kitchen tiling. The pan is completely non-stick and free of all contaminants like PFOA and PTFE. All parts that disassemble are fine to slip in the dishwasher keeping clean-up to a bare minimum. There’s even a serving spoon included which is a nice touch at this price-point. 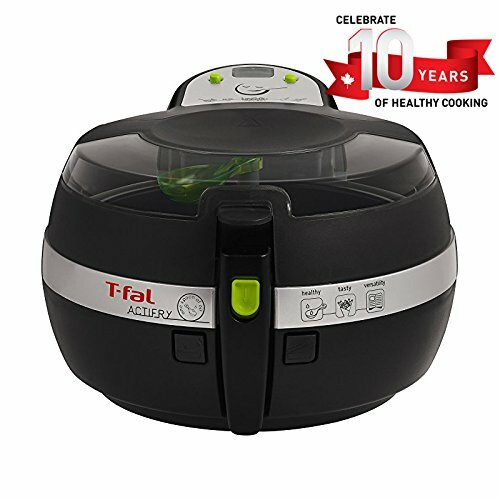 For a capable and versatile all-rounder at a price you’ll love, the T-Fal ActiFry is well worth popping on your shortlist. If you thought air fryers were all prohibitively expensive, meet the Bella which is a standout budget model that won’t stiff you on the performance front. You can fit 2.2 pounds of food in the dishwasher-friendly basket so you don’t need to worry about dealing with caked-on filth after you’re done cooking. 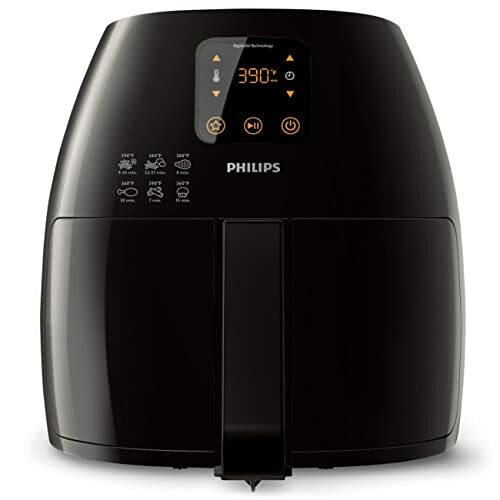 This air fryer packs a 1500-watt heating system based on convection oven principles. You’ll get your food crisp and brown but perfectly even with none of the sogginess you can experience with a microwave. Tweak the temperature from 175 degrees through 400 degrees Fahrenheit using the simple dial and manipulate the second dial to set the countdown timer. 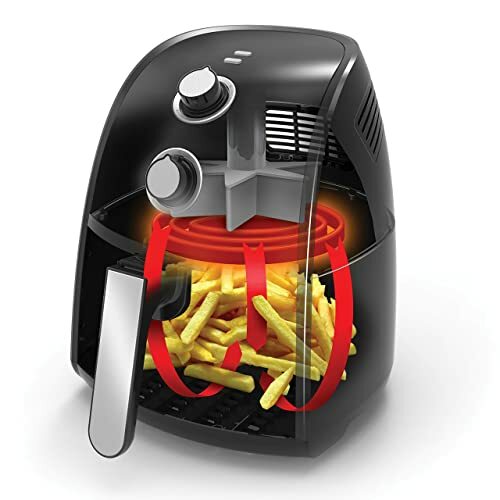 This model is a great chance to road test an air fryer without spending a fortune so what are you waiting for? 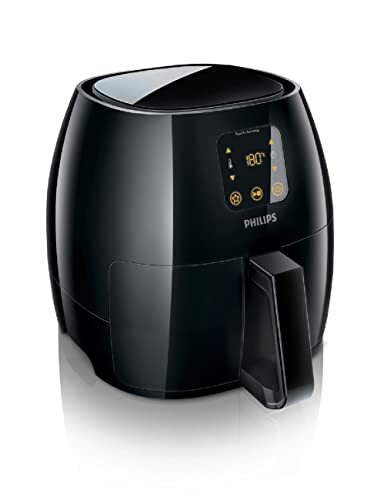 Next in line is another inexpensive air fryer currently up for grabs at an aggressive discount. While you won’t get temperature shut-off or any bells and whistles, you will get a solid and capable air fryer. Start treating your family to healthier food without all the fat you need for deep frying while retaining that golden taste and crisp texture. Generously sized at 3 ½ liters, you’ll be able to rustle up dinner for the whole family without needing too much space to house this slimline cooker. And the best thing? If you’re not delighted with your purchase, return it at any time during the first month and you’ll get a no-quibbles refund. You can’t really ask for much more than that! 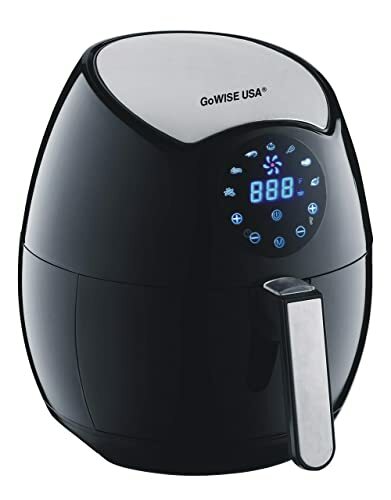 Looking more like a bulbous kettle than an air fryer, the design-driven GoWISE USA will make both a statement in your kitchen and first-class fried food the healthy way. Take control using the oversized LCD touchscreen and enjoy a broad temperature band perfect for a range of cooking applications. If you’re not entirely sure what you’re doing when it comes to air frying, you’ll get 7 settings programmed in so using this appliance is as simple as hitting those presets until you develop a little more confidence. While a few customers have suggested this product doesn’t last, it felt solid to us while we tested it but we’d suggest you do your own due diligence. 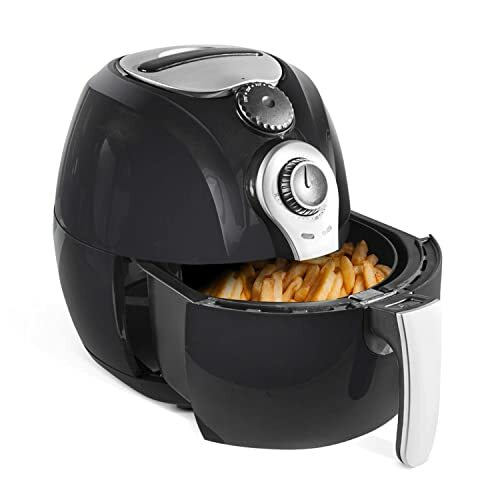 Our final air fryer today is now coming in at less than half-price so if you’re looking for a real steal, check out the Avalon Bay before it’s too late. What makes it worth your time, though? At 3.7 quarts, this is one of the larger 4-person air fryers out there so perfect for families with big appetites looking for a bargain. 1400 watts of power is more than fit for purpose and you’ll be able to crank the temperature right up to 400 degrees Fahrenheit to get things really heated up. If you’re caught on the fence about whether air fryers really work, why not give the Avalon Bay a shot? If you’re not convinced after the first 90 days, you’ll be eligible for a hassle-free refund so what have you got to lose? We trust by now you’re clear on what capacity you need if you want an air fryer capable of feeding the whole family. There are so many of these mini convection ovens on the market that we deliberately pruned our selection down to just the best 7. Sometimes, being confronted with too many options is a bad thing, confusing you more than helping. Any of these units we tested will give you the capacity, build quality and overall performance to enhance your cooking and improve the food you put on the table. If you’ve got any questions at all about air fryers, don’t hesitate to get in touch. If you want a larger capacity appliance, check out our study of those bigger air fryers right here. And don’t forget to bookmark our site and to come back soon. We’ve got plenty more lined up for you as always as we’re constantly looking for the finest products for your home.